This seminar will give teachers the tools they need to guide students in powerful and effective inquiry projects where students are thinking and collaborating in deep and relevant ways. 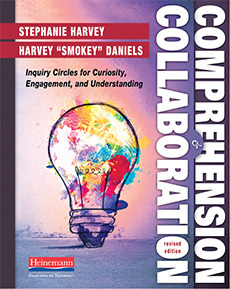 When students are taught explicit comprehension strategies, and explicit collaboration practices, they are equipped to acquire and actively use a wide range of knowledge throughout the content areas. As teachers gain the skills to facilitate inquiry, students think about content, wonder about information, actively use knowledge, and are far more likely to take action in the world around them. For seminar pricing information, please call 800.541.2086, ext. 1402. Download and share the latest issue of our Professional Development Catalog-Journal, edited by Ellin Oliver Keene – now with even more articles and content to help advance your practice!